5. Abdurakhmonov IY, Buriev ZT, Abdukarimov A, Saha, S, Jenkins JN, Pepper AE. 2017. Cotton PHYA1 RNAi improves fiber quality, root elongation, flowering, maturity and yield potential in Gossypium hirsutum L. US Patent, US 9663560 B2, Available at: https://www.google.com/patents/US9663560. Improvement of fiber quality of Upland cultivars (Gossypium hirsutum), while maintaining early maturity and productivity, is a fundamental problem in conventional cotton breeding. Phytochromes play a fundamental role in plant development, flowering and cotton fiber length. Targeted RNAi of PHYA1 genes in cotton suppressed expression of PHYA1 and/or PHYB, resulting in over-expression of the remaining PHYA2/B/C/E genes. This altered expression induced a number of phytochrome-associated phenotypes, including increased root length and mass, increased anthocyanin-pigment, vigorous shoot development and vegetative growth, early flowering, early boll maturity, increased fiber length and increased seed cotton yield compared to control plants. These RNAi phenotypes were stably inherited and expressed through four generations (T0-3) and were transferable from RNAi Coker-312 plants to Upland cultivars via conventional hybridization. Egamberdiev SS, Abdurakhmonov IY. 2013. Express method of detection of fungal species and thire races. Uzbekistan patent IAP 20130140. Priority date of application: 05.04.2013. Egamberdiev SS, Abdurakhmonov IY, Salakhutdinov IB, Radjabov FS, Mullaohunov BT. 2013. Allele specific primers for detection of races 3 and 8 of Fusarium oxysporium f. sp.vasinfectum. Uzbekistan patent application IAP 20130391. Priority date of application: 18.09.2013. Abdurakhmonov IY, Buriev ZT, Abdukarimov A, Ubaydullaeva KA, Makamov AH, Shapulatov UM, Darmonov MM, Turaev OY, Ruziboev HS. 2013. Cotton cultivar Porloq-1. Uzbekistan patent application NAP 20130014. Priority date of application: 15.11.2013. Abdurakhmonov IY, Buriev ZT, Abdukarimov A, Ubaydullaeva KA, Makamov AH, Shapulatov UM, Darmonov MM, Turaev OY, Ruziboev HS. 2013. Cotton cultivar Porloq-2. Uzbekistan patent application NAP 20130015. Priority date of application: 15.11.2013. Abdurakhmonov IY, Buriev ZT, Abdukarimov A, Ubaydullaeva KA, Makamov AH, Shapulatov UM, Darmonov MM, Turaev OY, Ruziboev HS. 2013. Cotton cultivar Porloq-3. Uzbekistan patent application NAP 20130016. Priority date of application: 15.11.2013. Abdurakhmonov IY, Buriev ZT, Abdukarimov A, Ubaydullaeva KA, Makamov AH, Shapulatov UM, Darmonov MM, Turaev OY, Ruziboev HS. 2013. Cotton cultivar Porloq-4. Uzbekistan patent application NAP 20130017. Priority date of application: 15.11.2013. Abdurakhmonov IY, Buriev ZT, Saha S, Jenkins JN, Abdukarimov A, Pepper AE. 2012. Cotton PHYA1 RNAi Improves Fiber Quality, Root Elongation, Flowering, Maturity and Yield Potential in Gossypium hirsutum L. U.S.A. Patent Application Numbers: Uzbekistan (IAP: 20120069), USA (USPTO:13/445696), and internationally (PCT/US13/27801). Abdukarimov A, Abdurakhmonov IY, Buriev ZT, Bozorov T. 2011. Small interfering RNA (siRNA) for knocking down gene expression in plant cells. Uzbekistan patent IAP 04300. Official bulletins of State Patents #2, 2011. Abdukarimov A, Abdurakhmonov IY, Buriev ZT, Bozorov T. 2011. Small interfering RNA (siRNA) for knocking down gene expression in plant cells. Uzbekistan patent IAP 04383. Official bulletins of State Patents #2, 2011. Abdukarimov A, Abdurakhmonov IY, Buriev ZT, Bozorov T. 2011. Small interfering RNA (siRNA) for knocking down gene expression in plant cells. 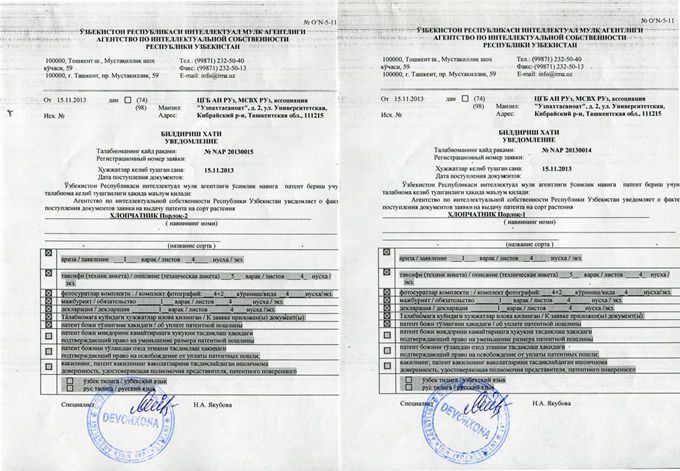 Uzbekistan patent IAP 04360.. Official bulletins of State Patents #6, 2011. Abdukarimov A, Abdurakhmonov IY, Buriev ZT, Bozorov T. 2011. Small interfering RNA (siRNA) for knocking down gene expression in plant cells. Uzbekistan patent IAP 04361. Official bulletins of State Patents #6, 2011.